Ice Mountain has a long reputation for being a dangerous and loose climb worthy of the heartiest climbers. Overall this reputation lives up however there is a route on this mountain that has much less class 4 climbing then the standard Northeast Ridge route. This is the southwest face. 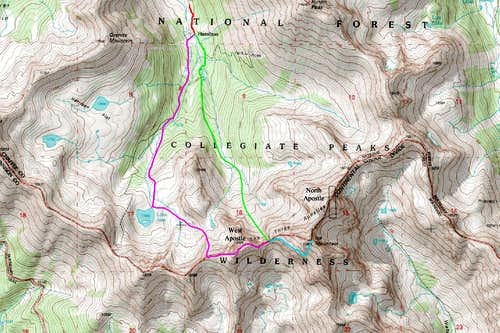 Although the climbing and traversing is much more sustained on this route, is is technically easier and less exposed than the standard route. There are two ways to do this climb depending on the season. I will describe them both. In the spring and early summer, variation 1 is recommended which takes advantage of the Apostle couloir. In late summer and fall, variation 2 is recommended which takes you up and over West Apostle from Lake Ann. The approach for this route is the same as the one for the Refrigerator Couloir and North Apostle. Start at the South Winfield trailhead (same as for Mount Huron) at the townsite of Winfield which lies at the end of Chaffe County road 390 12 miles from Highway 24. This road is a good gravel road suitable for almost any car although it is almost always washboarded. From Winfield, the Huron 4WD road continues up Clear Creek for two miles which is passable for higher clearance passenger cars (like a Subaru Forester). My 2WD Toyota Camry stationwagon made it just fine. 4WD is certainly not required for this road as it is not very steep...just rocky. From the trailhead described above, (where a green gate can be found and room for about 20 cars) there are two trails, the one that heads left up the hill is bound for Mount Huron. This is not the trail you want instead head streight ahead as the other trail follows Clear Creek on fairly flat ground. Follow this for 1.2 easy miles to a sign right before it crosses Clear Creek and heads up towards Lake Ann. This signed junction is key to the entire approach. Roach's description for this area is way off so ignore his approach description. If you are bound for this variant (The Apostle Couloir) you must take the left fork following the well established boot path into Apostle Basin. Follow this trail as it crosses the stream that drains Apostle Basin right before it converges with the main Clear Creek drainage. There are some minior ups and downs before the trail makes a steep 50 foot climb up to a small ridge seperating these two creeks. From this little vantage you can peer down either side at two different creeks right as they converge. It's a cool place. Continue up this trail as it follows on the right side of the creek often with a steep drop on the left into the creek. You will eventually emerge into an open meadow area where the trail becomes less defined just below treeline. You will cross back to the creeks' left side then you will likely have to do a little bushwhacking through the willows but if you head for a small island of trees it will save you some effort. From this small elevated area with trees (great campsites) you will have a perfect view to the south of the Apostle Couloir. To get to it, climb steeply for about 50 feet up the terminus of a large rock glacier and follow the talus up towards the saddle of Ice Mountain and West Apostle. The rock glacier is pretty loose but if you're here early enough in the season it may still be snow covered. Continue up the rock glacier until about 12,400 feet where the terrain begins to get considerably steeper. Ideally, there will be nice snow in the couloir above you. Put your crampons on and start climbing the couloir which gets gradually steeper with the steepest parts around 40 degrees near the top. Whenever you are faced with a split in the couloirs, always stay to the left. This 800 foot couloir dumps you right at the 13,200 foot saddle between West Apostle and Ice Mountain. From the saddle, climb up the class 3 headwall to the east and begin a long traverse across the southwest face of Ice Mountain. There are not many cairns on this traverse but as a good rule of thumb, you should gain about 200 feet in the first initial climb out of the saddle, then stay more or less at the same elevation (about 13,400) as you cross at least 5 small ribs and gullies. Keep in mind you are constantly traversing above a huge set of cliffs that guard the lower part of Ice Mountains' south face. Although the traversing is mostly class 2+, care must always be taken to avoid a casual slip. I felt the crux of this traverse was right after the climb out of the saddle when we crossed some smooth slabs that would be pretty slick if wet. This was also the spot with the most exposure as we were right above the lower cliffs as oppsoed to a hundred or so feet above them on the rest of the traverse. The rock throughout this traverse was generally pretty solid on the ribs and loose in the small gullies. A helmet is mandatory though. As you continue the traverse keep picking the easiest way through the gullies and ribs by doing short ups and downs while maintaining around 13,400 feet in elevation. You will eventually come across a set of two much larger gullies (trust me, you will know it when you see it - these gullies are WAY bigger than the ones you traverse across). These two gullies are seperated by a large rib (much larger than the ones you crossed) and either of these two large gullies will work for your final 600 foot ascent. The one on the left (first one you get to) is much more solid but steeper and has more class 4 climbing near the top where you will hit the saddle between the false and true summits. If you decide to take this left, more solid gully, you will have to traverse the west ridge of Ice slightly until you reach a 40 foot overhanging cliff which marks the top of the rib seperating the two large gullies leading to the summit. This 40 foot cliff also lies right over the notch that the Refrigerator Couloir route brings you to. To avoid this cliff Drop down to the south (class 4) and get into the right gully 100 feet below the summit which then takes you directly to the top (class 3). From the end of the long traverse, cross the first big gully you see (described above) and cross below the large rib seperating them (you may have to descend slightly to do this) then start your final 600 foot ascent up the right gully. This gully is VERY loose so i would advise everyone in your party to climb together. The difficulty doesn't exceed class 3 but keep in mind, I thought this gully made Thunder Pyramid feel like solid granite! The nice thing though is that the rocks are mostly scree and small cobble sized so knocking a 500 pounder down isn't as likely. This gully takes you directly to the true summit. When I climbed Ice Mountain, we ascended the left gully and descended the right gully. Return the way you came on the traverse. If you feel up to it, from the saddle above the Apostle Couloir, the ascent up West Apostle is an easy (class 2) 400 foot climb and the views of the southwest face on Ice Mountain are remarkable! When snow filled all the way to the bottom, the Apostle couloir makes a great glissade or ski for those who have the skill and experience to do so. Small rocks that have fallen from above can be scattered around though. For this variation, which is better done in late summer and fall when all the snow has melted brings you past Lake Ann. This is a much longer day and required more up and down. From the signed trail junction 1.2 miles from the 4WD trailhead, instead of heading left up the Apostle Basin trail, bear right, cross Clear Creek immediently and continue up the very well established trail to Lake Ann. From the lake, you will follow the West Ridge Route on West Apostle to the summit. See Larry's description via the link. Basically you start climbing talus eastward from the lake, cross one N-S ridge and climb south up the second one to a small saddle in the main west ridge of West Apostle. You should see a small tarn just to the east below the N-S ridge you climb. Continue up the class 2+ west ridge to the summit of West Apostle. You can preview the southwest face route from here very well as well as take a good look at the weather. Plan on at least 6 hours round trip from here. Descend the class 2 east ridge of West Apostle to the saddle above the Apostle Couloir and continue on the route described in Variant 1. Return the way you came. If you do the Apostle Couloir, bring axe, crampons, stiff boots and approach shoes of some kind (for the rock and trail approach). Otherwise, a sturdy pair of boots, standard hiking gear and a HELMET! A lot of mountaineering experience particuairly on loose rock would help as well as a perfecr weather day. Escape off Ice Mountain is very limited. Climbing the Three Apostles has always been something I looked forwards to as kind of a "Sawatch finisher". Last year at this time I never thought I'd have the skills to climb Ice Mountain but after a year of hiking and climbing I have grown more comfortable with harder and looser terrain. My friend Josh (as well as many others Colorado natives) had always told me that Ice Mountain was a class 4 ascent however, me being the true believer in the accuracy of Roach's books, I argued my point to death that it can be done with only class 3 climbing. 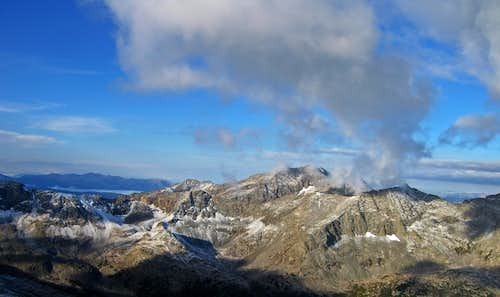 People gave me so much grief on 14ers.com for thinking this as many great mountaineers have been turned around on this mountain usually on the so called NE ridge (traverse from North Apostle). All I have to say is, do not do this route. Why this is the standard route on Ice is beyond me but it shouldn't be. It is hardly ever free of snow and when covered it is a very dangerous and difficult climb. Anyways, I was ready to tackle the Three Apostles and my adventure began solo on May 28th where I climbed North Apostle. 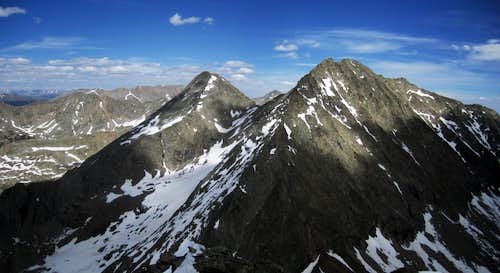 For this I was mainly looking to get a lay of the land and see what the best way up Ice would be, as well as climbing one of the centennial 13ers. On May 29th, I hiked the trail to Lake Ann to see the conditions on that side of West Apostle and lots of lingering snow below treeline and around the lake made me decide not to go over West Apostle to climb Ice. I got good look at the Apostle couloir and the NE ridge on Ice mountain from North Apostle and my climb was decided. I would climb Ice Mountain using the SW face route with the Apostle Couloir. This would prove to be the best climb I've done in the Sawatch. I started by driving to the Huron trailhead to which I was surprised to see that my trusty 1987 Camry made it all the way to the end of the 4WD road at the gate. Since the weather was so nice, my casual 12 noon start wouldn't matter. I began hiking up the nice trail and entered the Collegiate Peaks wilderness after 0.6 miles and hit the signed junction for the Apostle Basin trail after 1.2 miles. I was greeted with fantastic views of the Three Apostles as I walked up the wide and lush valley. I hiked up the Apostle Basin trail and was glad to see the trail was snow free all the way to the base of the large rock glacier extending down from Ice Mountain. Since my goal for the day was North Apostle, I hacked my way through the willows and followed the base of the rock glacier to an open 300 slope to the left. Climbing this talus and willow slope got me to the base of the large spire at the base of the west ridge. There was some easy snow to climb to get to the base of this large spire that seemed to dominate my view to the southeast. Once at its base, I traversed around it on talus and made my way along the south side of this ridge crossing snow slopes and talus. Below me to the south was a small still frozen tarn and a high and wild basin still full of snow. Views to the north of Mount Huron were stunning. Eventually I was able to locate the Refrigerator Couloir and was awed in amazement. It was still holding snow but thinning out fast. How anyone would climb this amazes me as one would have to be very accustomed to rockfall. I noticed a handful of Volkswagon sized boulders just chilling at the base of this couloir. Wonder how they got there??? As I climbed higher the talus got looser but not too unbearable. I located the choke I had to climb to gain the saddle between Ice and North Apostle. I saw moderate snow slopes for about 400 feet below it and put my spikes on to negotiate these slopes. Since it was around 2pm the snow was pretty soft but still firm enough to avoid postholing. Climbing through this choke would have been a cakewalk if there was no snow but it was more fun with snow. After a couple class 3 moves to avoid the ice that had covered much of the rocks I was on my way up the final few hundred feet to the saddle. From this saddle, views down to the east revealed a part of the Sawatch very close to me, the Emerald Group. 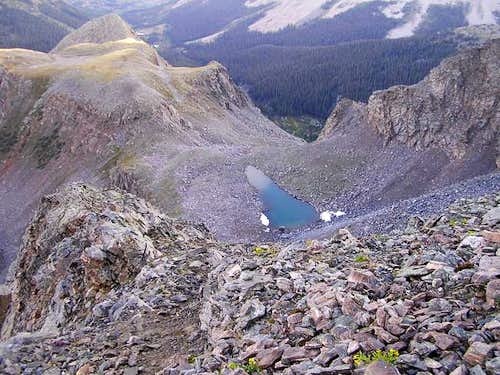 My first climb in the Sawatch was Iowa from Clohesy Lake via the loose west ridge in fall 2009. At that time I was in no way a climber or peak bagger and I ended up traversing around Emerald while my friend climbed it. I didn't think it was worth summitting and we descended to the small mining shed below Emerald before hiking back to the lake. Looking at these peaks brought back great memories of my first Sawatch sufferfest a few years ago. 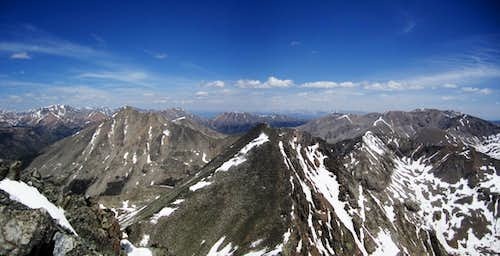 As I write this, I still have to climb Emerald, which is my last Sawatch centennial I need. Climbing the final few hundred feet to the summit of North Apostle provided even more views of Huron, the Emerald group, and Ice Mountain. Man Ice was beautiful from this little perch and the standard route looked sketchy as hell. It was such a nice warm and calm day I sat here in complete solitude for over half hour before descending. Ice Mountain and the "fridge"
The descent was rather uneventful although I did manage some nice glissades below the choke. Hiking back down the trail back to the trailhead gave me some fantastic views of the Three Apostles and getting one last look at the Apostle couloir cemented my plans to climb Ice and West Apostle from this couloir in a couple days time. I got back to the car at 6:30 pm to see all the Huron hikers gone. Since this was Memorial day there was at least 20 cars at the trailhead. They were all on Huron though and I didn't see a soul of any of the Apostles. I cooked myself some dinner and camped by the car to a peaceful and warm night. I woke up and decided to make a quick hike up to Lake Ann to see the conditions up that way. It was an easy hike to about 400 feet below treeline where lingering snow in the trees made it a pain to get to the lake. It wasn't very hard as it was warm at night and the trail was completely hidden. I never actually reached the lake shore but I knew from the day before it was still frozen over. The snow in the trees pissed me off even more so I just turned around. This even further cemented my plans to go back to Apostle Basin and climb the Apostle Couloir. I drove back to Golden and invited Josh to join me on Ice Mountain. Since he had always been interested in this peak, he happily joined and so we had a good meal and decided to leave at 3am from Golden the next day. We had a fantastic weather forecast and were full of excitement. The alarms went off and by 3:45 we were on our way. I got to drive the 4WD road again and got more funny looks from campers along the road. Even had one guy tell me great work! By 8:00 am we began up the trail again and I could feel the anticipation in the both of us. Not only would this be a great Sawatch capstone peak for both of us, this was Joshs' first snow climb. I told him he would like it as you can gain elevation so quickly, which is one of his goals...to see how fast he can gain elevation. The approach was the same as it was for North Apostle but when we reached the base of the rock glacier, we climbed up on it and walked along it all the way up. Around 12,400 feet in elevation we took a break, changed our footwear from approach shoes to mountaineering boots and put our crampons on. We hiked on the snow for a short distance to an old snow slide where the couloir got steeper and I ate a final snack knowing this was going to be a fast climb. Josh started his watch and we were both off. 800 feet of 40 degree snow lie ahead of us and a mere 19 minutes later, Josh made it to the saddle without stopping once. It took me 24 minutes as I had to take the occasional 10-15 second breather. The couloir started around 35 degrees and ended at about 41 degrees. Upon reaching the saddle we were greeted with breathtaking views to the south and was glad to see the initial climb out of the saddle dry. We rested, boasted our climb times and took our crampons off and switched footwear again. The climb out of the saddle was a straightforward class 3 pitch and our long traverse across the SW face of Ice began. Rib after gully after rib after gully we continued the tedious traverse gaining little elevation. We had to keep on our game the entire time as there was the cliffs below us all the time. This traverse kind of reminded me of the ledges on Longs Peak. I guessed we crossed 7 or 8 ribs and gullies all of which were small. Some of the gullies held a little snow but overall the whole traverse was dry. We were looking for a significantly larger double gully system that would lead us right to the summit. I soon spotted a large gully ahead after an hour of traversing and we got into it. It had a distinct left and right fork though and we didn't know which one was correct so I took a glance at the first one (the one to the west) and said "this will work". We began scrambling up this steep gully and to my great surprise this was pretty solid rock. I had been warned by the absolutely terrible rock on the south gully but as we climbed the rock seemed to just get better. The last couple hundred feet was blocky and solid making for enjoyable scrambling. This whole gully was sustained class 3 climbing. Just as we were approaching our last hundred feet though, Josh let loose a 40 pound boulder that instantly went roaring down the gully taking about a hundred other rocks of all sizes down and over the cliff at the bottom. What a sight this was. Good thing no one was below us...it would have been certain death as the entire gully was flying with large rocks below us. I can't stress this enough...DO NOT climb below anyone anywhere on Ice Mountain. Although the gully seemed solid (we ascended the wrong gully...more later) there were the hidden disasters waiting. We soon reached the ridge somewhere between the false summit sppire and the true summit. It was at this point I realized we ascended the wrong gully as the one further east went straight to the summit. The false summit looked badass as it was a spire with one large boulder sitting on top! The remaining route involved the only class 4 we would have. We scrambled along the ridge towards the summit and peered down the "fridge" couloir and were again awed. What a fantastic but dangerous route! We came to a cliff in the ridge that was overhanging forcing us to downclimb about 60 feet (4th class) to go around it. This dropped us into the correct gully for the route and the final hundred feet was a loose talus climb to a small summit. I was now sitting on my favorite mountain to date without a cloud in the sky at about noon. It was calm and warm and we spent 45 minutes sitting in this grand place admiring the views and what we accomplished. Taylor Reservoir to the south, Huron and company to the north and all the remaining Sawatch 14ers to the southeast. Looking down on North Apostle was pretty cool. It was painful to leave this place but the time came and we began the long descent. We decided to descent the correct gully only to find that this was one loose place. This gully was by far the loosest place I've ever been. So loose I told Josh we would descend one at a time in 100 foot intervals. Even with my best efforts to keep rocks in place (which I consider myself very good at), I send hundreds of small rocks down the gully. Good thing no one was coming up...although it is likely rare to have more than one party on this mountain per day if any. We kept alternating on the descent down this gully until we got back to the place we entered the first gully just to the west where we re-traced our steps along the traverse. Maroon Peak seemed like solid granite compared to this stuff! Some long thin snow patches on the north flanks of each gully proved to be more problematic on the way back for whatever reason. We saw another huge rockslide across the valley in the upper Texas Creek basin before finally making it back to the saddle above the Apostle Couloir. We took another break, stashed our packs and began the east class 2 ascent up West Apostle. What a breather this was compared to Ice. Views of the SW face on Ice Mountain got better and better and looking at it from a distance made us think "How the hell did we cross that!" We reached the summit of West Apostle fairly quickly around 3pm and took another 45 minutes here admiring the views of Ice Mountain. I thought the views from this perch were better since we got a broadside view of Ice and the view directly down the valley was stunning. To the west lie Lake Ann. As the day was winding down, we made the quick descent back to the saddle but we soon realized we have much more excitement to come. The snow in the Apostle couloir softened up enough to glissade so we donned our nylon pants, gloves and axes while putting everything else away and I was the first one to head down. It was one very fast glissade. Even though the run-out was completely clear of rocks, there were small rocks that had fallen into the couloir and just sitting there so I kept a firm grip on the brakes to avoid these rocks. Sometimes I would spot them ahead of time and turn myself! This made the descent back to the rock glacier very quick and fun. The remaining hike out was filled with talk about how great the climb was. By 4 pm we were on the trail heading back down through the trees. Clouds finally started to block the sun on the hike down but it didn't matter now. Once back at the car, there was no one else at the trailhead and the long drive home was capped with a stop at Subway in Leadville...my typical post-climb food. I would highly recommend these peaks to others but I must warn everyone that experience on loose class 3 and 4 terrain is required as well as snow climbing experience. Make sure you go on a perfect weather day as escape from these peaks is difficult at best during a storm. The gully to the west of the main gully on the SW face is a better ascent option as it is much more solid. Descending either gully will work fine. Though people will disagree with me, I recommend this route over the standard NE ridge route. It isn't necessary to traverse from North Apostle to Ice in order to have loads of fun. I hope everyone found this trip report useful...now I'm off to climb Emerald: one of my last Sawatch centennials and to reflect at how far I've come since 2009...and how far I still have to go to climb the mountains of my dreams.